You have made the first step in purchasing the right welding equipment for your automotive repair needs. So how do you keep yourself and your staff safe while operating your automotive welding equipment? Best welding safety practices and equipment are universally applicable. Welding exposes everyone to similar hazards, whether you’re responsible for safety at a large welding-intensive manufacturing company, a billion-dollar engineering-construction firm or a small independent collision repair shop, here are a few tips for improving welding safety. Your welding equipment should contain a manual with important safety information, as well as procedures that will maximize the machine’s full potential during use. Make sure everyone who operates the machine is familiar with its contents. Most manufacturers provide on-line manuals for easy reference for those instances when you lose your original printed copy. Exposed skin is susceptible to the painful and damaging effects of ultraviolet and infrared rays. Sparks that are emitted when welding can catch in open pockets, pant cuffs or down a shirt that isn’t completely buttoned. Smoldering and going unnoticed while the welder is “under the hood” can prove to be a dangerous and harmful situation to be in. Button shirt collars, cuffs and front pockets to prevent them from catching sparks and to cover exposed skin. Do not keep matches or butane lighters in your pockets. Avoid wearing cuffed pants, as the cuffs may catch sparks. Shorts nor short-sleeved shirts belong in a welding environment. Even a quick tack weld requires the proper safety gear, including helmet, gloves and clothing – right down to your footwear. Flame-resistant clothing should be worn, such as denim pants and a shirt made from tightly woven material or a welding jacket. Proper fitting gloves with ergonomically curved fingers and different designs for specific welding processes are readily available for those in the trade. Note: Gloves are not sufficient to pick up just-welded material. Use pliers or proper metal tongs to avoid burns. Protect yourself by wearing a respirator or fume extractor. Either source of protection can be utilized as an engineering safety control to protect you when welding from the occupational hazards presented with various welding applications. 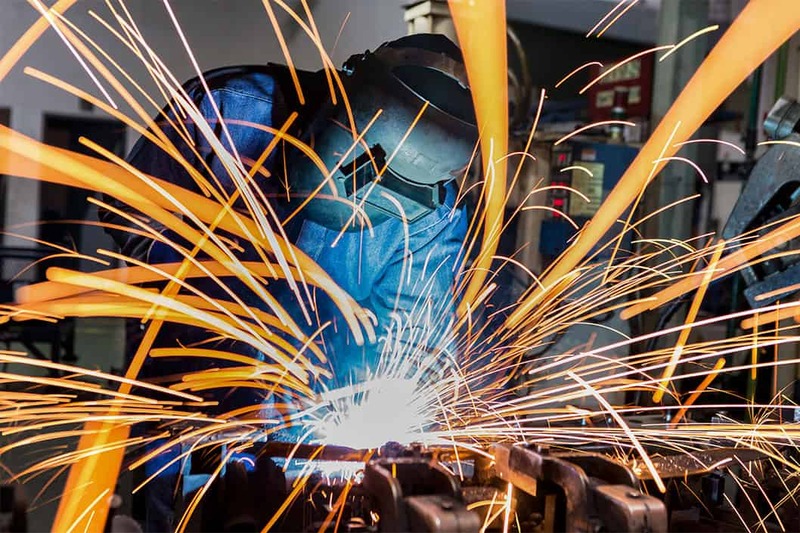 It takes only a moment of exposure to a welding arc’s rays for unprotected eyes to experience “arc flash,” a painful condition that may not appear until hours after the exposure. Welding helmets should be properly fitted with a filter shade to protect the operator’s face and eyes when welding or watching. Note: Approved safety glasses with side shields and ear protection should also be worn under the helmet. There is a place for everything, and everything in its place. Weld areas should contain tools and equipment that operator use; nothing more, nothing less. Weld tables should have a scissor mechanism that presents the work to the operator at the appropriate height to ensure a proper workspace. Make sure your area is clean of anything that could catch fire from welding sparks. Just because something is sitting on the other side of the welding area does not mean it will not catch fire. Just be cautious aware of your surroundings. These are just a few tips to keep you safe during your welding activities. Turn to your equipment manual, the manufacturer or the experienced team at Chesapeake Automotive Equipment for all of your safety concerns.